The Dining Hall is a large, vaulted ceilinged, impressive room, formally the village Bakery, with wide, French Oak floor boards. 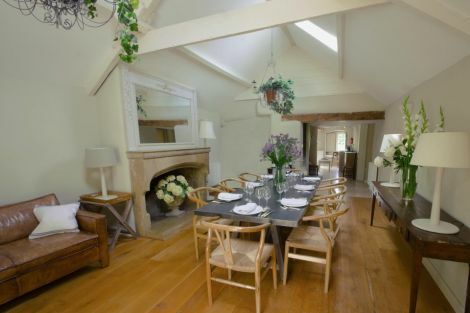 A fabulous space to enjoy a celebratory Dinner Party with family or friends. 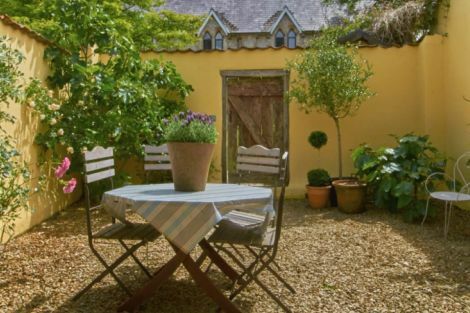 The dining table can seat up to 12 guests at this unique self catering holiday cottage near Bath. Many guests enjoy the services of a private chef to help ease the strain! 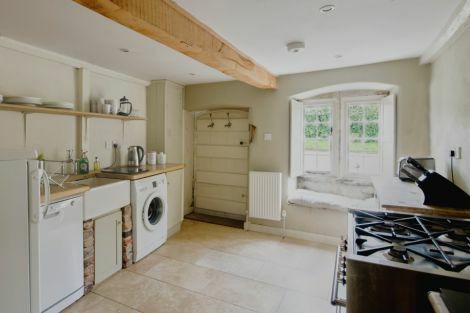 The fully equipped country style kitchen provides everything you need for entertaining in house, as an alternative to the wonderful array of local pubs and restaurants. It is a mix of handmade fitted units and antique free standing cupboards, creating a wonderful stylish look. The kitchen has modern appliances including oven/hob/grill, large fridge, sink, worktops and all the crockery, glassware, cutlery and cooking utensils you will need. 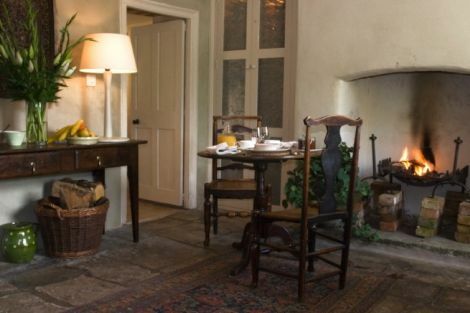 The 400 year old flag stone floor gives this room a lovely cottage feel. There is a small table and chairs, an open fire and shutters at the window. This room can also be used as the 5th bedroom with 2 x singles bed if you are a party of 12 guests. A perfect room for a relaxing, long country style breakfast. This beautiful sheltered, private area is walled and has a mediterranean feel. There is a gate up to a gravel garden area (this area is shared). Book online or please email or call John or Karen on 01761 241704 or 07767 202295 if you prefer to book via BACs transfer (leave a message if unanswered and we’ll get straight back to you). We also have a Booking Enquiry Form if you prefer.